The purpose of the fold-down rear seatbacks is to allow you to carry longer objects than could not otherwise be accommodated. 1. 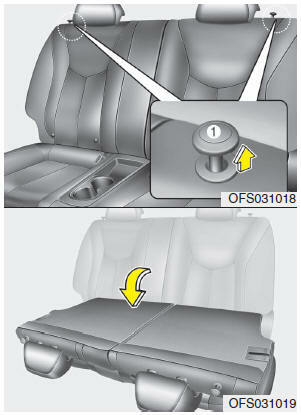 Insert the rear seat belt buckle in the pocket between the rear seatback and cushion, and insert the rear seat belt in the guide to prevent the seat belt from being damaged. 3. 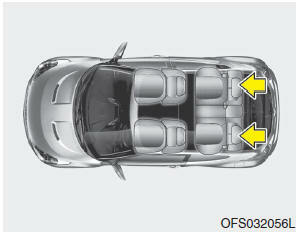 Lower the rear headrests to lowest position. 4. Pull the lock release lever (1) and fold the rear seatback forward and down firmly. 5. To use the rear seat, lift and pull the seatback backward. Pull the seatback firmly until it clicks into place. Make sure the seatback is locked in place. When you return the seatback to its upright position, always be sure it has locked into position by pushing on the top of the seatback. 7. When the seatback is completely installed, check the seatback folding lever again. When you fold the rear seatback or put luggage on the rear seat cushion, insert the buckle in the pocket between the rear seatback and cushion. Doing so can prevent the buckle from being damaged by the rear seatback or luggage. 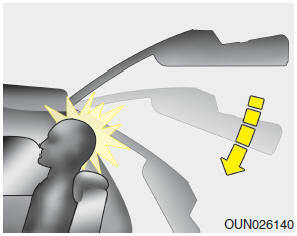 Rear seat occupants should always remain in the center of the seat cushion so the occupant’s head is protected by the headrest. If not, the tailgate may hit the occupant’s head, which could injury. Make sure the engine is off, the automatic transaxle is in P (Park) or the manual transaxle is in R (Reverse) or 1st, and the parking brake is applied whenever loading or unloading cargo. Failure to take these steps may allow the vehicle to move if shift lever is inadvertently moved to another position. • For maximum effectiveness in case of an accident, the headrest should be adjusted so the middle of the headrest is at the same height of the center of gravity of an occupant's head. Generally, the center of gravity of most people's head is similar with the height of the top of their eyes. Also adjust the headrest as close to your head as possible.The use of a cushion that holds the body away from the seatback is not recommended. • Do not operate the vehicle with the headrests removed as severe injury to an occupant may occur in the event of an accident. 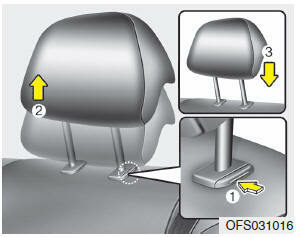 Headrests may provide protection against severe neck injuries when properly adjusted. 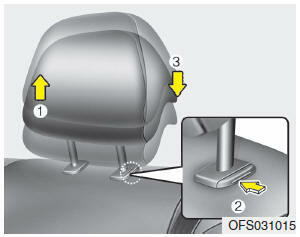 To raise the headrest, pull it up to the highest position (1) by pushing the release button. To lower the headrest, push and hold the release button (2) on the headrest support and lower the headrest to the lowest position (3).